Created in close collaboration with the clients as part of a new home build by Dorrington Homes, this unique kitchen and stylish en suite were expertly designed, manufactured and installed by Retreat Design. 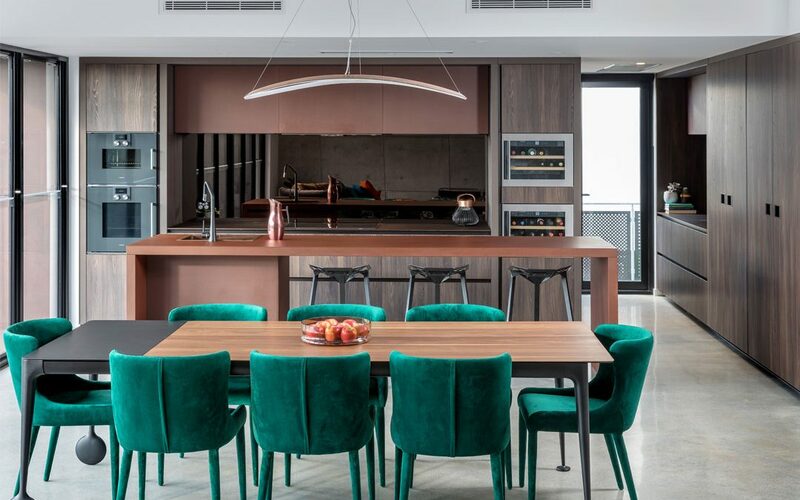 To achieve the desired aesthetic, which challenges conventional trends, striking products and finishes were incorporated within all areas of the Watermans Bay home. Showcasing a poured concrete wall, the spacious en suite features an array of matte-black fixtures, including a Gessi Goccia freestanding bath spout, curved towel holders, and basin mixers fitted to a stunning ‘Volo Green’ vanity unit by Altamarea, which is exclusively available through Retreat Design. The modern copper mirrors beautifully complement the vanity unit’s PaperStone® ‘Chocolate’ finish, which provides added warmth to the industrial-styled space and achieves a truly unique result. 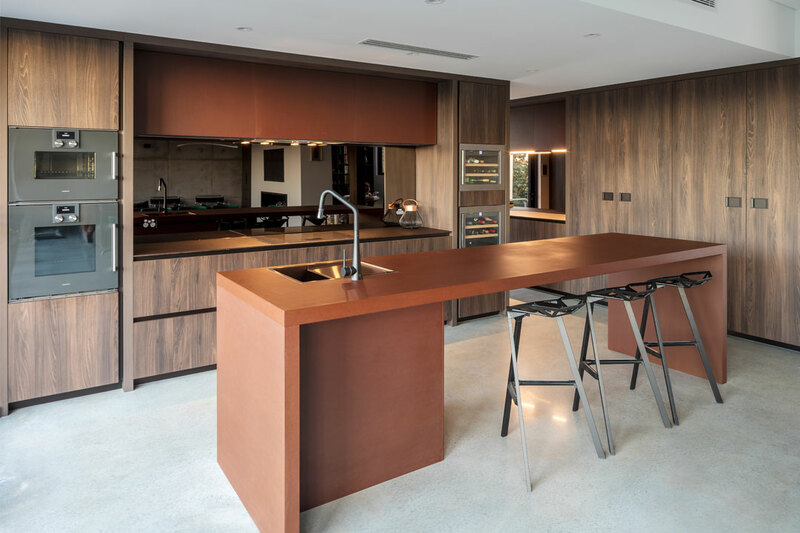 The streamlined kitchen features a large island bench with a luxurious Caesarstone concrete top, a copper Spectra undermount sink by Oliveri and a matte-black TINK-D mixer by Armando Vicario. Creating the illusion of increased space, the smoked-glass splashback from MirrorKote is an elegant addition to the bespoke open-plan area. An established importer of bespoke cabinetry, Retreat Design completed the outstanding kitchen with a combination of two cabinetry styles by Arrital, including convenient overhead cupboards with a contemporary PaperStone finish, and contrasting drawer and pantry fronts in a beautiful timber laminate. Established more than ten years ago by Steve Johnson, Retreat Design closely collaborates with clients, architects, builders and designers throughout Perth to ensure every brief is achieved with precision. 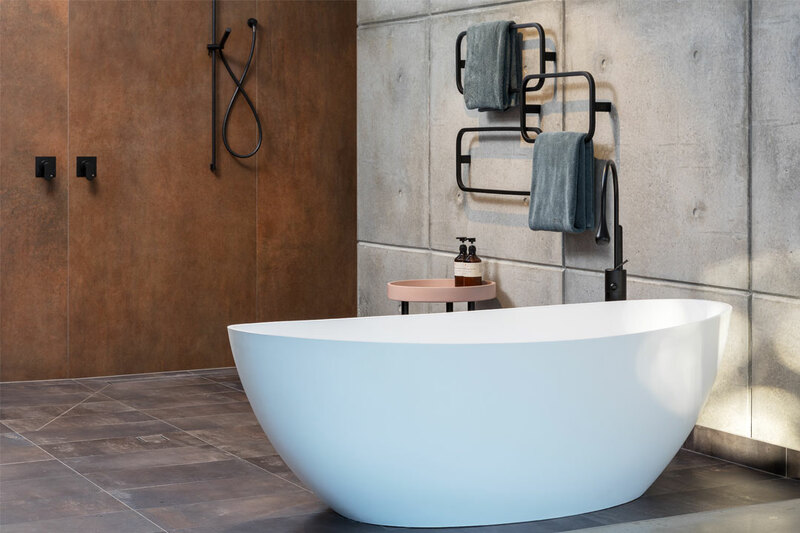 Specialising in the design and installation of kitchens and bathrooms, the company provides exemplary products from an esteemed selection of European cabinetry manufacturers, including Altamarea, Arrital, Dall’Agnese, Effeti, and Rifra. Retreat Design’s experienced team of designers are qualified interior architects, which ensures a high level of technical detail is evident in every design they complete. Perfectly merging industry trends with your lifestyle needs, the friendly team offer an impeccable service that promises a unique result. The company also has extensive experience working with architects, builders and developers on large-scale residential projects, including the incredible Vivid Blu residences in Mindarie.